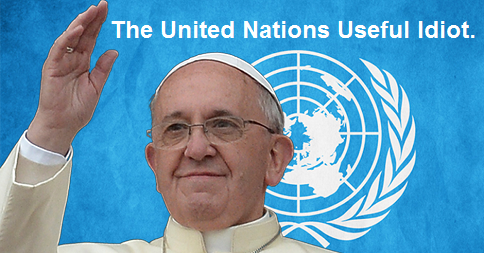 Everyday the clock ticks toward the Pope’s visit to the US in September 2015, to deliver his encyclical inside the chambers of our Congress, as well as at the UN conference, we move closer to a “new world order” oppression that is nothing but a Marxist takeover by the elite globalists! Do not think that your local government is not on board, in fact it is time for everyone to get on the horn and start calling these elected officials out for what they are…traitors! This plan, will transform our lives, to a point that we can no longer live according to our own free will. Life as we knew it will be unrecognizable, do not take this lightly! Have you not noticed tanks and foreign military personnel moving about the country? 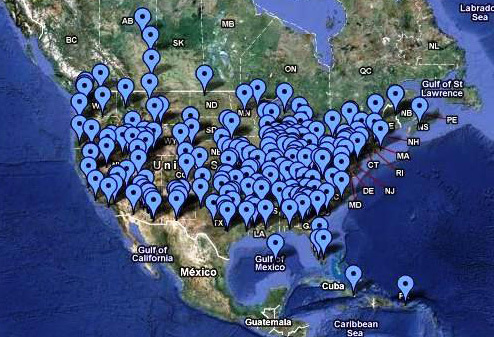 Have you not seen the map of FEMA detainment camps, and the construction of more, going on every single day?Have you not asked yourselves WHY Obama wants your guns to complete the UN, and NDAA deals? Wake UP! 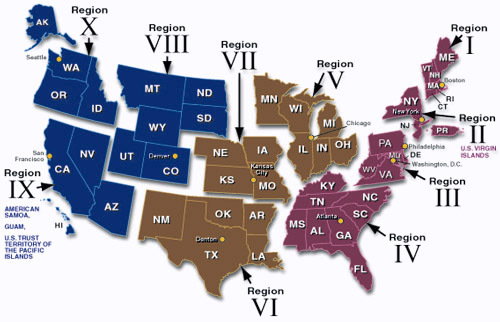 The plan is to divide the US into TEN regions, no longer the 50 United States. I urge EVERYONE, EVERYWHERE, to stand up, and demand that this charade be stopped. It is fraud, and in no way, did UN Agenda 21 have the consent of the people, anywhere. Like the fate we suffered, by the Federal Reserve Act of 1913, this I assure you will be worse. Not only have they taken our prosperity, this cabal of bankers and corporations have “fundamentally transformed America” as AKA President Obama would put it, and it is NOT in the best interest of the people AT ALL . It is designed to enslave every person under the guise of climate chaos. this is a climate chaos, that they geoengineered, and as usual they want the taxpayers to pay for the residual fallout of their insanity. Part of this insanity, includes reduction of our population by 90%! (Google the Georgia Guidestones, their plan is literally etched in stone.) It is no longer acceptable for Americans, or anyone across the globe to look away. This is an urgent call to activism, get on the phones to the above listed people, write…they need to hear it 24/7 nonstop! Please remember that we are a thousand to their one, it has to be done in unison or divided we will all fall, and it will be fatal. If you are not familiar with this hidden plan, please see the UN Agenda 21 document HERE. Also, see the Iron Mountain Report HERE. 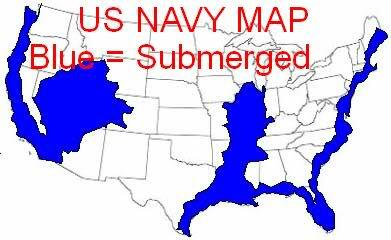 Navy map of future US!!! With weather geoengineering, aka weather manipulation, many speculate that after being moved to coastal areas, we will be submerged. Depopulation plan indeed. READ WHY HERE. If anyone doubted the intentions of Pope Climate Fraud l aka Francis the Marxist Argentine, they need only look to the guest list of his upcoming workshop titled, “Modern Slavery and Climate Change: The Commitment of the Cities to recognize the blatant political motivations and objectives. The Vatican is joining with like-minded Marxist Democrats to force unconstitutional controls on the American people. Francis is clearly working to implement a global climate religion of Earth worship, though in the initial stages it will be sold as humanitarian and in keeping with the Bible. Marxism and Christianity are incompatible and this guy is clearly a Marxist. That’s a serious concern for Catholics when he minds his own business. It’s an emergency for all of us when he doesn’t. A contingent of ten Democrat mayors, all communist or leftist leaning, is led by New York City’s “Red Bill” de Blasio. De Blasio was raised by communist parents, fervently supported the Marxist Sandinistas in Nicaragua in the 1980’s and celebrated his honeymoon in Cuba at a time before America had officially decided that brutal and murderous dictatorships were cool. According to Breitbart News, the other political hacks who will be engaging in the scam include: Charlie Hales of Portland (OR), Marty Walsh of Boston, Ed Murray of Seattle, Mitch Landrieu of New Orleans, Betsy Hodges of Minneapolis, Matt Appelbaum of Boulder, William Bell of Birmingham, Sam Liccardo of San José and Ed Lee of San Francisco. 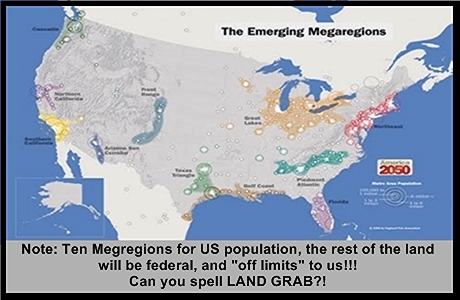 A geographic mix which was surely intended to infect America homogeneously with the imposition of the phony full frontalassault on our Constitution and our freedom. Governor Moonbeam, Jerry Brown of California, who studied for five years as a fellow Jesuit colleague of Pope Francis, will be in attendance as a “climate expert.” Brown has no formal training on the issue or he’d be in the opposition, realist camp, but he’s qualified by virtue of his dogmatic adherence to the “man-bad, man must pay, man must obey” mantra. There were no Republicans among those selected by His Unholiness to receive thirty pieces of silver. 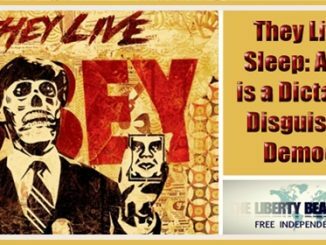 The Vatican’s hypocritical “End Slavery” website promotes the One World Government agenda through the proclamation of what are blatant, proven lies as being truth and relevant to saving the world from their climate hoax. The falsehoods include a statement that “As a matter of fact, global warming is one of the causes of poverty and forced migration, which are breeding grounds for human trafficking, forced labour, prostitution and organ trafficking.” While those conditions do exist, they’ve existed since the beginning of time, with the exception of organ trafficking, long before the first oil rig penetrated the Earth. There is no “fact” that pins the responsibility for social problems on the use of fossil fuels. Nobody says, “Damn it’s hot, I think I’ll go steal someone’s liver or find me a girl real cheap. It’s a totally dishonest and ridiculous assertion. Yet these “respected” public servants and a “respected” religious leader are not only signing on their names under the lie, they’re peddling it to their uniformed citizenry and followers. The page goes on to say that “More than 30 million of people are currently victims of modern day slavery, trafficked in a hideous market with estimated illegal profits of $US150 billion a year. From the very beginning of his pontificate, Pope Francis has taken a firm stand against modern slavery, calling all communities to reject entirely and without exception all systematic deprivation of individual freedom for the purpose of personal and commercial exploitation.” The elimination of slavery is an admirable goal, though unattainable, but it has nothing to do with how Americans heat or cool their homes. This gathering is just another step along the path to Paris in December and the UN taking control over our nation and the world. Things become even more obvious in view of Red Bill de Blasio’s intention to tie the event in with a speech promoting his own Marxism in New York City plan known as OneNYC, which, according to Breitbart connects the non issue of climate to “correcting” income inequality. Red Bill and Francis need to be careful, their agenda is showing from behind the curtain. Climate Nazi Jeffrey D. Sachs, a product of the perversion of Columbia University, as are de Blasio and the White House occupier, helped write the climate encyclical that Pope Francis signed his name to and also organized the event. He gushed on Wednesday about how “Francis was ‘extremely excited about Mayor de Blasio coming.’” Maybe he’s hoping for a second, matching hammer and sickle crucifix as a gift. Breitbart also noted that on Wednesday, there will be UN Sustainable Development Solutions Network on Cities and the Sustainable Development Agenda workshop, “Prosperity, People and Planet in the Cities.” Anyone who has read about UN Agenda 21knows that the name has changed to the ambiguous “sustainable” everything and can appreciate how dangerous this is and the true nature of these meetings. They are the implementation of global government and the elimination of our nation, our Constitution and our way of life under submission to the UN. Why are the streets not filled with angry citizens looking to find one or two of these criminals to make an example of? The truth is that every one of those involved in this and similar conferences and efforts can only be one of two things. They are either in the majority, as a lying political operative engaged in the development of a system for overthrowing the governments of the world or an uneducated useful idiot. The “science” relied upon for their assertions is demonstrably false and being fully aware of the fraud being perpetrated they still willfully choose to use it and fabricate more of the same in support of their agenda. Americans need to wake up to what is going on. There is nothing Holy about this alliance or the Vatican agents engaged in the great deception. It is an extremely dangerous and real threat to our survival as a free nation.